In Colombia, South American country, has grown up the intention to protect the paramos (a unique ecosystem in the region), and the water as the most higher manifestation of nature and the life. One of the main worries is the advance of the mega-mining over the territory as synonym of obliteration, expulsion, rupture of social structures, insecure and difficulty for food safety. The most alarming is the threat against the life itself, in consequence of the destruction of the paramos, principal ecosystem that produces water. Multiples expressions for the advocacy of the water have been done in different dimensions like the legal, social, technic, artistic, etc. But we believe that ones are not enough for the importance that has the water and the preservation of the environment. We consider it is necessary to make visible constantly, our position against the mining projects in paramos zones, with a socially organized activity that involves creativity and assertiveness, to create awareness about the true values of the Mother Earth. Therefore, from the caricature art, we want to join efforts and voices. In the advocacy of our territory, rivers, lakes, and paramos that are slowly being destroying with mega-mining activities. 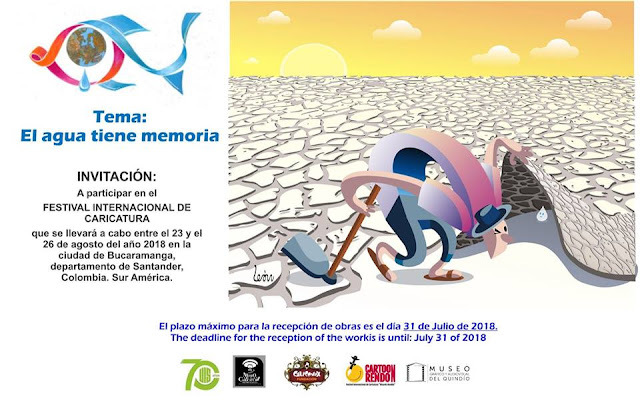 To participate in the INTERNATIONAL CARICATURE FESTIVAL: THE WATER HAS MEMORY, that will take place between 23 and 26 of August in Bucaramanga city, ubicated in the department of Santander, Colombia. The call is for all the caricaturists all over the world. The issue is: The water has memory. Each participant can send maximum three (3) works. You can participate with works that have been awarded or published. Each work must be accompanied by the following information: Name and last name; E-mail; Original Country. By submitting the work means that you accept the participation and authorize the organizing committee of the event, for the publication of your work in print and/or electronic media. The organizing committee reserves the right not to exhibit works that attempt against an individual or collective rights. The event has a deep sense of solidarity in defense of the páramos and water and is carried out nonprofit. All caricaturists will receive a certificate of participation. The three (3) best works will be chosen and their authors will receive a diploma of excellence.